A key part of a Gin and Tonic (or Vodka Tonic if you must) is the tonic water. A good tonic water will make the drink and can cover a lot of problems with the gin. A bad tonic, on the other hand, can bring even a drink made with the most perfect gin down to the level of swill. We decided to take one for the team and taste as many tonics as we could get our hands on (in the Boulder area) and figure out what we liked and disliked. 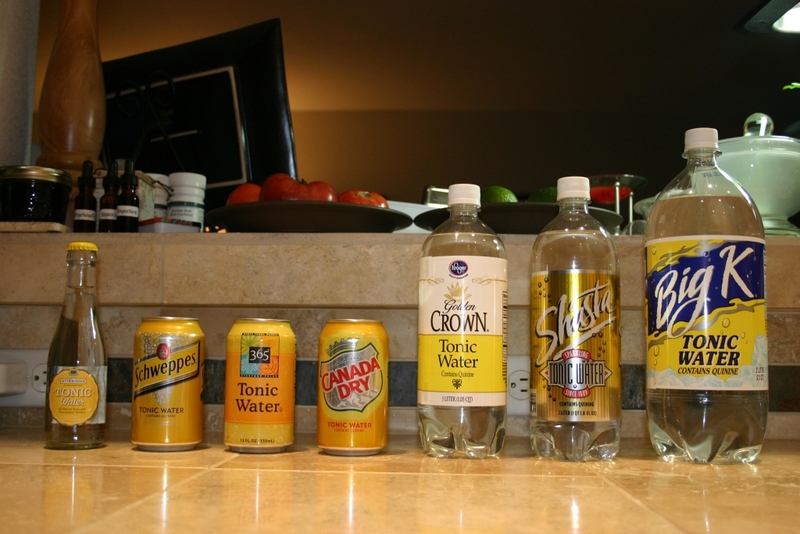 The tonics we were able to get were (listed in order of our preconceived notion of their tastiness, low to high): Big K, Golden Crown (Kroger Brand), Shasta, Canada Dry, Schweppes, 365 (Whole Foods Brand), Stirrings and my homemade tonic. For this tasting there were four of us: Sean, Amanda, Aaron and Myself. [Big K] This tonic had a nose that was not so great, which didn’t start us off well. Aaron felt it tasted like “air with bubbles.” Sean gave it slightly higher praise saying it was “sugar water with bubbles.” Overall it was not at all sour, had very little quinine bitterness, basically Sprite with a touch of quinine. [Golden Crown] This tonic too had little to no quinine bitterness which is especially interesting since it was less sweet than the Big K. Usually when you add sweetness you will mute some of the bitterness. We also felt this tonic was too lightly carbonated. [Shasta] Amanda felt this one was a touch too sweet commenting “Holy sweetness batman!” Shasta did have the most quinine of the three we’d tried to this point though which was a good thing. Sean and I felt this tonic was on par for sweetness with the other two but added some additional bitterness and citrus sourness. If you were throwing a party and expecting to go through a lot of tonic water this would be our recommendation. It’s cheaper than Canada Dry and Schweppes and still has a nice flavor. [Canada Dry] This tonic was Aaron’s favorite coming in to the tasting and remained as such. Aaron liked that it was definitely carbonated, more so than the others we’d tried. Sean also commented on the carbonation, liking the larger bubbles. Amanda was the one voice of dissent for this tonic stating that it was “kind of muted and watered down” and as such she “wouldn’t drink that one.” The overall consensus is that this one had more of a quinine bite, which is what I like in tonic, but slightly less sweet and sour than the Shasta. Overall this is the favorite super market tonic of Sean, Aaron and Myself. [Schweppes] As opposed to Aaron Schweppes was my favorite super market tonic coming in to the tasting. As you can see from the above comment I change my allegiance. Amanda thought this was much more like a proper tonic than Canada Dry and as such this is her favorite super market tonic. Sean really liked the nose but felt the flavor was more muted than the Canada Dry. Overall it seemed that this tonic had less quinine than Canada Dry but was a bit more sour, they were both on par for sweetness. In a comment I had given on Chowhound I had put 365 over Schweppes and Canada Dry in taste, I don’t any more however. Sean liked the 365 more than Schweppes but it didn’t quite over take Canada Dry. There is less bitterness in this one than either Schweppes or Canada Dry where the sweet and sour remain about the same. Our feeling is that the cane sugar over powers the quinine. If you’re morally against high fructose corn syrup I think this is going to be your best bet for super market tonic. [Stirrings] This is the only store bought premium tonic water I got my hands on for this tasting and I can’t say we were impressed. There is more quinine than some of the others but the sourness is less prevalent. Sean liked the nose on this tonic the best of those we had tried. This tonic, unlike some of the others, contains no salt and its also made with cane sugar rather than high fructose corn syrup. We all liked this tonic but felt it wasn’t strong enough to stand up to a powerful gin in a G&T. Were you looking for a good Vodka Tonic mixer I think this would be a good choice because of the nice flavors. Overall I don’t think this tonic is worth the extra money, stick with Canada Dry or better yet, make your own. [Homemade] Sean’s first comment I think sums it up very nicely “Yummy!” We used 3/4 oz tonic syrup to 2 oz soda water to mix this up and felt it needed a bit more soda water. Although at this ratio we did feel that this tonic would even stand up to the Old Raj, which is really saying something. Overall we all liked this tonic the best and the best part, at least for me is the customizability. Sean likes his tonic a bit less sweet where I like mine a little sweeter. Not a problem with this tonic. Mix it up a little less sweet and add simple syrup to up the sweetness if you so desire. A great time was had by all and it was nice to experience all of these tonics at one time. It really gave us a chance to decide what we liked best. In summary, if you’re throwing a party and serving a ton of G&Ts pick up the Shasta, it won’t do you wrong. For the everyday home mixologist we’d recommend Canada Dry, although Schweppes is also very good. I’d reocommend trying both and deciding which you prefer. And finally, if you have the time and motivation definitely try making your own tonic. The results are truly a special cocktail. There are two other premium tonics, Q and Fever Tree, that I’ve heard very good things about but haven’t gotten my hands on as yet. If I can score some of these I’ll be sure to update the tasting notes to include them.